A culture of financial anxiety and ecological worries birthed the “tiny house” movement. Now, Italian architect Beatrice Bonzanigo is taking the miniature house off the grid as she prepares to showcase her Casa Ojalá at Milan Design Week in April. Casa Ojalá is a self-contained modular home design, measuring only 27 m2 (290 ft2). 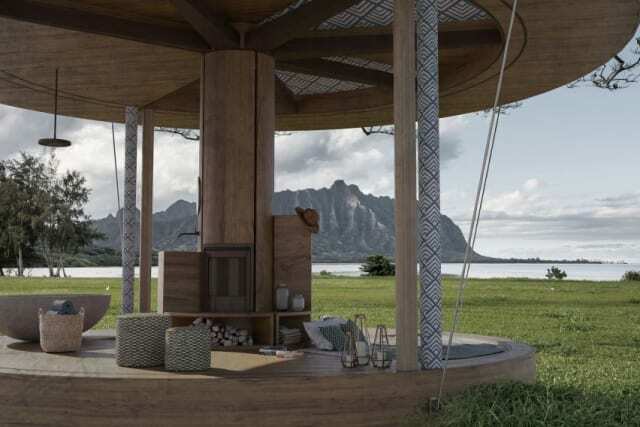 The circular home can be “arranged” in 20 different ways by adjusting wooden partitions and fabric “walls” with built-in ropes, pulleys and cranks. Whatever way the owner decides to arrange the structure, it’s set up to include two bedrooms, a bathroom, a terrace, a small kitchen, and a living room. The house can be set up totally independent from municipal water and electricity, as it includes photovoltaic panels, a rainwater collection system, and a septic tank. According to Bonzanigo, it’s designed to have a minimal impact on the environment around it, and the woods and fabrics used in its manufacture can vary depending on where it is built, for maximum sustainability. Bonzanigo’s design parallels the tiny house movement: a U.S.-centric architectural movement that found its roots in the 2008 financial crisis. The most common definition for a tiny house is one that is between 100 and 400 ft2, far smaller than America’s typical 2,600ft2 houses. The movement is coming at the same time as modular housing gains more of a foothold in the construction community, driven by lower costs, more predictability, and a shortage of construction workers. Modular micro-home companies like Nomad, Kent Homes and Hummingbird now offer a selection of tiny homes that are easy to assemble. These bespoke modular mini-homes still tend to be priced toward the pricier end of the housing market, but advocates see them as a gateway to a more frugal and ecofriendly future. When asked about her design, Bonzanigo said, "Ojalá is a word that summarizes the concept of infinite possibilities, hopes related to emptiness and absence, intuition, a key of a door not yet open, a new field of existence, a telescope that brings together and moves horizons, a space of different possibilities and, therefore, a wish that comes true."